Accurate soil water content simulation is the basis of disaster early-warning and evaluation about waterlogging and drought. In order to more accurately simulation the water movement in wheat field with temporary field ditches, a two-dimension soil water simulation model was developed in this study. The model included the water movement vertically(up and down) and horizontally(ribbing and ditch), and traditional runoff estimation was replaced by calculating the drainage water from ditches. The model could simulate the comprehensive effect of depth of plow layer, initial soil water content, precipitation intensity and infiltration rate of plow pan layer on runoff. The application of the model in Xinhua city, China showed good agreement between observation with simulation values. 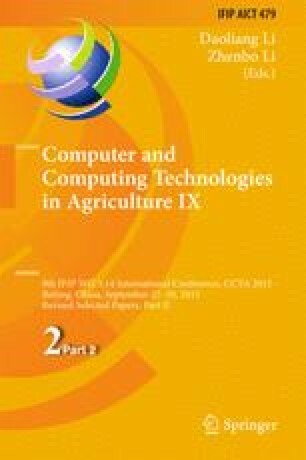 This study was funded by the Special Fund for Agro-scientific Research in the Public Interest (201203032), Jiangsu Province Science and Technology Support Program (BE2012391), and the Fund for Independent Innovation of Agricultural Sciences in Jiangsu Province (CX(12)3055).